The International Harvester Scout is one of the most iconic off road vehicles in US history. Aside from the early Ford Bronco, very few classic ‘SUVs’ are as recognizable and loved. With a removable hardtop and folding windshield, the Scout had many of the quirks found in the Jeep Willy’s -albeit a spot more comfortable, depending on who you ask of course. The boxy shape with curved edges make the Scout 80 the best looking of the lineage. A pair of round headlights and a rectangular grill opening remained throughout the Scout’s 19 year lifespan. Various forms existed including a pickup truck and Sportop convertible. No matter which model year, the driver can expect a raw and visceral driving experience that can’t be replicated, especially in a time where the combustion engine slowly surrenders to the electric motor. Possibly the best way to enjoy a classic car is by converting it to a ‘retro-rod’ or ‘resto-mod’ where new and old technologies are grafted together to enhance a classic model. Common upgrades include ditching the carbureted engine for a modern fuel injected model. However, a newer ideology has begun to sprout up where fuel economy and torque are valued over massive horsepower V8 swaps. One such example is the JKScout -created by PTL Off-Road built right here in our new homebase in Pendleton, Oregon. I recently came across this unique vehicle while heading downtown to the local brewery: The Prodigal Son … great place, I highly recommend it! 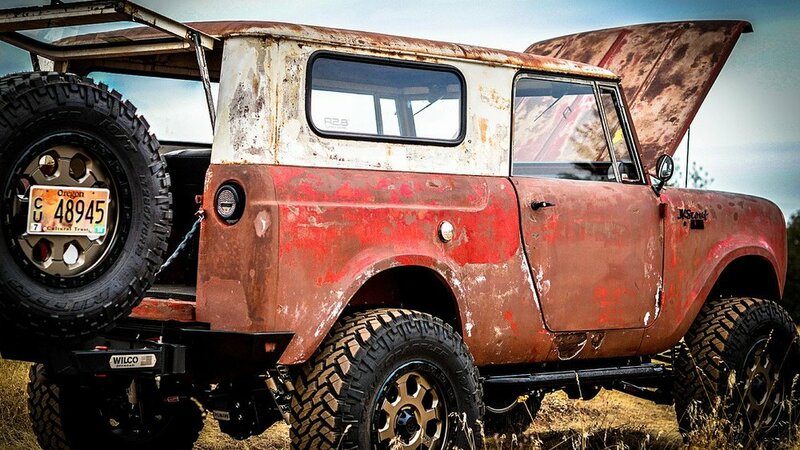 Despite its rugged exterior, I could tell there was something special about this particular Scout. All of the underpinnings were clearly brand new - even the paint still looked fresh, which is impressive since this rig just completed the 800 mile Cummins Repower Cruise. Oh, did I mention that this rig is powered by the Cummins R2.8 turbo diesel? This 4 cylinder engine creates 161 hp and 310 lb/ft of torque and averages 20-25 mpg. The body off restoration also included a frame swap from a 2015 Jeep JK, and a set of diff-locked JK Rubicon D44 axles. There are countless upgrades throughout this build, far more than can be covered in proper detail here. However, it’s now currently for sale! [Edit] The JKScout has sold. Which means serious buyers can bend the ear of the current owner about all the details.